A beautiful holiday village of red and white bungalows surrounding a swimming pool and gardens. Stone pathways lined with palms and bougainvillea lead between the bungalows in this spotlessly clean holiday complex. Just 1.5 km from the centre of Caleta de Fuste, the Fuerteventura Beach Club Bungalows complex is the perfect base for a holiday in Fuerteventura. The complex has two outdoor swimming pools including a childrens pool which is surrounded by a sun terrace with loungers and a pool bar to keep you refreshed. If you're self-catering then the complex has everything you could need with a mini supermarket, laundry, an A la Carte restaurant and clubhouse. 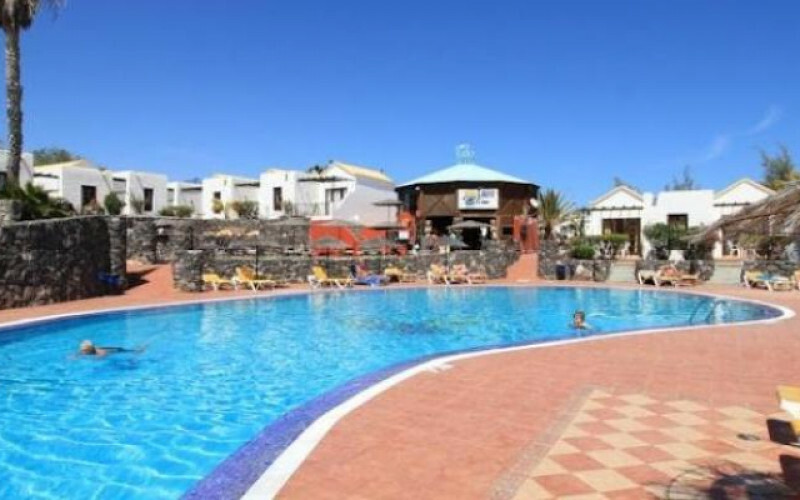 You have the added advantage of having access to the facilities of sister resort, the Elite Fuerteventura Club which is across the road and where you can make use of the gym, squash courts, tennis courts, health club and sauna. For nights out you can either stay on-site or take the short journey into the centre of Calente de Fuste where there is a great selection of restaurant and bars along the sea front. If you would like to go shopping for souvenirs then the newly built Atlantico shopping centre is a great place to start. The on-site reception offers a selection of services from car hire and money exchange to helping arrange excursions should you wish to explore the island. All the bungalows are on the ground floor with either one or two bedrooms, a bathroom, living area and kitchenette equipped with a fridge and coffee maker. They are all comfortably furnished and have satellite TV, internet access as well as a private terrace or patio area where you can relax outdoors and enjoy a drink.